This is the third and final post about the children’s song, “De Maitiid.” To conclude, let’s look at one of the verses that was not translated on Mama Lisa’s website. Twa looks very much like what it means in English: “two.” Say it with a -w- and an extra- long “ah” like in “father," rather like the first syllable of the word “twaddle.” TWAAH. Jong is pronounced with a full “oh” as in “row” or the exclamation “oh!” It too is a cognate, this time meaning “young.” YOHNG. Minske was discussed just below in Part II. Hert means “heart” and is said with the “eh” sound in “wear”… think of “wearing your heart on your sleeve” to remember the vowel. HEHrt. 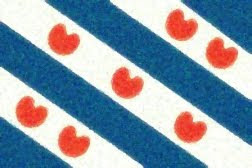 Troch is West Frisian for “through.” It is a very common word and is quite useful to know. Say it with an “oh” like in “row” and the harsh “ch” in the German “Bach” or Hebrew “l’chaim!” TROHch. To review, de means “the” and is said with a schwa. Leafde gives us another example of spellings changing over the past century: it is under ljeafde in P. Sipma’s glossary. Leafde, however, is the correct modern spelling. This is the word for “love,” and it is said with an “ih” vowel as in “bit” followed by a schwa, with another schwa on the end. LihUHv-duh. My best guess on bin is that it is a conjugation of the verb “to be.” In any case, it sounds just like the English word it looks like. Ferbûn is from ferbine, which means “to connect” or “to bind.” Say it with an “eh” in the first syllable and a full “oo” as in “moon” in the second syllable. FEHR-boon. Remember, en means “and”; it is pronounced with an “eh” as in “pen” or “ih” as in “pin.” EHn. Also recall that it is said with a schwa and means “the” or “it.” UHt. Besletten means “establish.” The first syllable takes a schwa, the second an “eh” as in “let,” and the last syllable another schwa. BUH-sleht-uhn. As a side note, words beginning in be­- in modern Frisian are sometimes spelled beginning with a bi- in Sipma’s glossary. As discussed in the very first lesson, ‘t is a short form for it, pronounced with a schwa. Grut (or grutte) is an essential word to know! It means “large,” “great,” “grand,” “important,” and so on. Say it with an “oo” as in “moon” and a schwa on the end. GROO-tuh. Libben means “life” and is pronounced with an “ih” as in “live” and a schwa in the second syllable. Lih-buhn. Begûn is from the verb begjinne meaning “begin” or “start” (old spelling: bigjinne). Bih-GOOn / BUH-gyih-nuh.